The adventure continues. 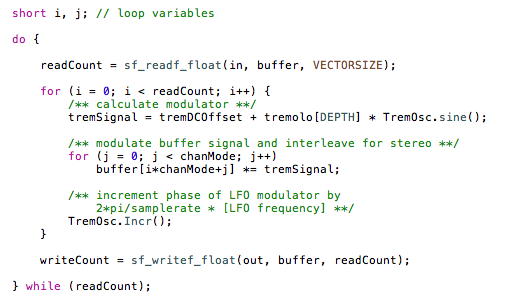 This time we occupy the world of tremolo as a digital signal processing effect; also known as amplitude modulation. My studies into the area of audio programming has progressed quite far I must say, covering the likes of filters and delays (get your math hats ready), reverb, and even plug-in development. In order to really solidify what I’ve been learning though, I decided to go back and create a program from scratch that will apply tremolo and vibrato to an existing audio file, and that’s where this blog entry comes in. For now I am just covering the tremolo effect as there is plenty to discuss here on that, while vibrato will be the subject of the next blog entry. Tremolo in and of itself is pretty straightforward to implement, both on generating signals and on existing soundfiles. (Vibrato on the other hand is easy enough to apply on to signals being generated, but a bit more complex when it comes to sound input). Nonetheless, several challenges were met along the way that required a fair amount of research, experimentation and problem solving to overcome, but in doing so I’ve only expanded my knowledge in the area of DSP and audio programming. I think this is why I enjoy adventure games so much — chasing down solutions and the feeling you get when you solve a problem! 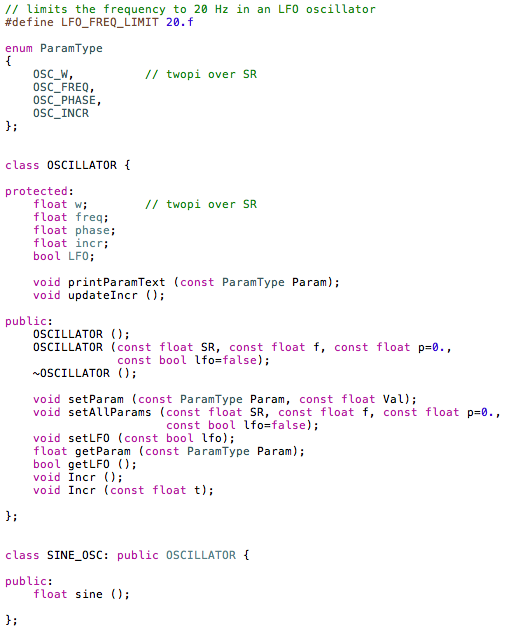 This is where the power of C++ and object-oriented programming start to show itself. It affords the programmer much needed flexibility and efficiency in creating objects that can be portable between different programs and functions for future use, and this is definitely important for me as I can utilize these for upcoming plug-ins or standalone audio apps. Furthermore, by designing it with flexibility in mind, this will allow for the modulation of the modulator so-to-speak. In other words, we can time-vary the modulation frequency or depth through the use of envelopes or other oscillators. Values extracted from an envelope or oscillator can be passed into the “oscillator” class which processes and updates its internal data with the proper function calls. This will allow for anything from ramp ups of the tremolo effect to entirely new and more complex effects derived from amplitude modulation itself! But now let’s get on to the listening part! For this demonstration I extracted a short segment of the Great Fairy Fountain theme from the Zelda 25th Anniversary CD release, probably my favorite theme from all of Zelda. This brings up another challenge that had to be overcome during the development of this program. Prior to this most of the work I had been studying in the book “Audio Programming” dealt with mono soundfiles. For this I really wanted to get into handling stereo files and this presented a few problems as I had to learn exactly how to properly process the buffer that holds all the sound data for stereo files. I am using libsndfile (http://www.mega-nerd.com/libsndfile/) to handle I/O on the actual soundfile being processed and this required me to search around and further adapt my code to work properly with this library. At one point I was getting very subtle distortion in all of my outputs as well as tremolo rates that were double (or even quadruple) the rates that I had specified. It took a lot of investigation and trial & error before I discovered the root of the problem lie in how I was handling the stereo files. In closing off this blog entry, here is a further processing I did on the Zelda sample. After applying tremolo to it using the program I wrote, I put it through the pitch shifter VST plug-in I implemented to come up with a very eerie result. ‘Till next time! This entry was posted in Audio, Programming and tagged amplitude modulation, C, C/C++, class, DSP, LFO, libsndfile, object-oriented programming, tremolo on April 18, 2012 by Chris. Now let’s move on to generating the sawtooth wave and we’ll see how the simple sinusoidal wave above is transformed into a more complex waveform through the use of the Fourier series equation. I set the total number of partials to 30 for this demonstration, and sawtooth waves contain all partials of the harmonic series with the amplitude of each equal to 1/partial (ak = 1/k). We also set the phase offset as ø = -π/2. 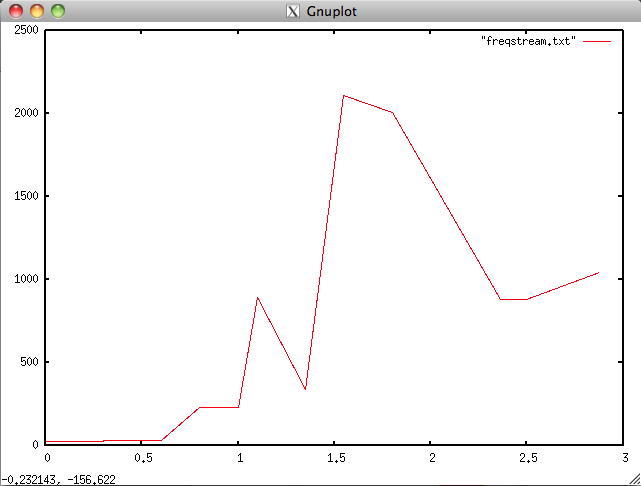 The code that reads the breakpoint data uses linear interpolation to find the value at time n / sample rate. The normalize_buffer routine adjusts the resulting amplitude to fit within the values of -1 and +1 and then scales it to the desired amplitude set by the user (in this case 0.7). 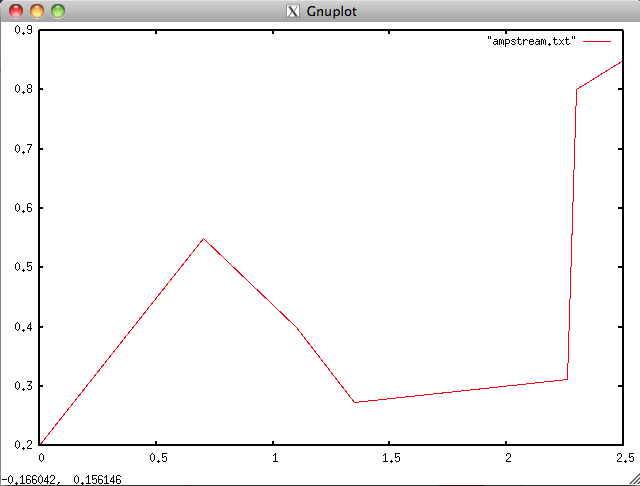 Following is a snapshot of the resulting waveform (just before the 1 second mark) in Gnuplot as well as the soundfile output; the result of just summing together simple sinusoidal waves as seen in the first Gnuplot above! This is a short and simple example of how flexible and powerful the Fourier series can be at creating textures and complex waveforms through additive synthesis. The possibilities just escalate from here, depending on the time-varying functions that determine the amplitude and frequencies applied to the individual sinusoidal waves, i.e. the harmonics. It must be pointed out that the code used to implement these routines above is brute force and not optimal. For instance, to calculate these 3-second waves at a 44.1 kHz sampling rate with 30 partials requires 30 iterations through 132,300 (3 * 44,100) samples of data for a total of 3,969,000 loop iterations! Calculating sine and cosine values is actually quite a costly operation, so this is unacceptable for most practical purposes. One alternative is wavetable synthesis, whereby the data for one period of a basic wave is stored in a table and can then be looked up and utilized by the program. This is much more efficient (though depending on the size of the table, there can be a loss in precision) as redundant trigonometric calculations don’t have to be repeatedly calculated. This is potentially another topic for another time however. For now, hope this was an interesting look into additive synthesis using the Fourier series and how with relatively few lines of code we can make some pretty cool things happen. This entry was posted in Audio, Programming and tagged additive, breakpoints, C, Fourier, harmonic, partials, series, synthesis on April 6, 2012 by Chris.